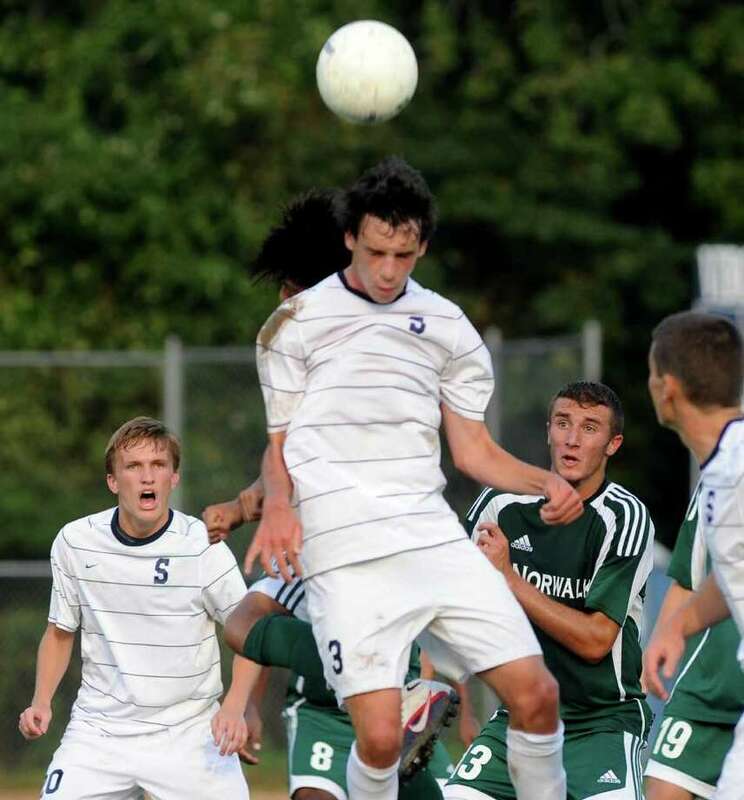 Staples' Ben Root, 3, uses his head against Norwalk Friday. The Wreckers defeated Brien McMahon 1-0 Monday but still missed Root, who was out because he was sick. The Staples boys soccer team felt it didn't play its best game Monday but it will graciously accept the win. Dylan Evans saved the Wreckers from settling for a tie by scoring with 1:25 remaining in the game in their 1-0 home victory over Brien McMahon. "It was great to score and help our team pull through with a win," Evans said. "I had just gotten nailed in the head by the ball while playing defense, and so getting up the field was difficult. " Evans added, "After I got the ball and dribbled around a few defenders, I knew I had a bad angle and it was a low percentage shot. But I went for it anyway, and I got the result." Staples raised its record to 6-0-1. McMahon dropped to 1-5. "We always tell the guys it doesn't matter who scores or when the goal comes. The important thing is to get a goal, and make sure the other team doesn't score," Wreckers coach Dan Woog said. "We proved that today. Even though it was not our best match -- in fact, it was pretty lackluster -- we fought to the end. Dylan Evans was the hero today." He added, "The next game, it might be someone else. That's what Staples soccer is all about, and that's why we're having such a fun time this fall." The Senators got up for this game and didn't play like a typical 1-5 team, which made it difficult for Staples. "Every team -- no matter what their record -- gets up for Staples. Brien McMahon gave us a great battle today," Woog said. "Every game from here on in will be a dogfight. Challenging for the FCIAC and state championship is as much about mental toughness as it is about physical strength and stamina. We welcome those challenges." For a large majority of the game, the Wreckers had very little luck, as did the Senators. McMahon out-shot Staples 5-4 in the first half, but most of its shots came from long range thanks to a gritty defensive performance. Staples threatened early in the game when senior Max Hoberman rushed on the goal and crossed it to junior Lorenz Esposito, who continued only to boot it off the post. The remainder of the first half was much less intriguing, as that shot came in just the second minute of the game. The second half brought a bit more excitement, with Staples getting two big chances for goals on great balls from senior Kyle Hoberman and junior Dylan Hoy. However, both chances proved to be fruitless for the Wreckers as senior goalkeeper Roberto Vargas (six saves) made two quality saves. The game remained scoreless. Staples outshot McMahon 13-8 and dominated on corner kicks with a 9-2 advantage. "Sometimes you're good. Sometimes you're lucky," Woog said. "Today we did not play well. We were very lucky. But we'll take this kind of luck." Evans said, "It was tough match for us because it was our third straight game without a practice. Our game was off a little, but we are a gutsy bunch and will always scrap it out, like we did today."